Stamina sorcerers are actually quite powerful in raid settings, and is a great class for stamina damage-dealing. Here is my take on an effective stamina sorcerer build and rotation. Please keep in mind that these are all simply what I personally use and are my own recommendations on my preferred stamsorc build. There are many alternatives to the build that other people may prefer, and I will talk about them as well. In fully optimized raids, Automaton armor and jewellery + Mechanical Acuity armor and weapons seems to be BiS. However, that build will also be something hard to sustain unless you're a Redguard, so in that case, I would suggest VO + Automaton. I'm personally not a fan of racial passives; most people are pretty much forced to pick an "optimal race" in order to be able to min-max. Still, here are some raw stats on races that have something to do with stamsorcs, ranked from best to worst (personal opinion). General rule of thumb is that a higher stamina pool is going to grant you more damage with your abilities. Stamina recovery is less sought-after in this stamina sorcerer build since each rotation contains 4 heavy attacks already. Here, this may mean that you might want to prioritize a higher stamina pool. That +10% stamina buff on Redguards and Imperials can net you about 8% more damage compared to, say, Argonians. That ~3k stamina difference can mean a damage difference of 1k+ per DoT, and in a full rotation it can add up. The same can be said about Khajiiti crits, and that added critical chance is rather appealing to many players. However, while the sustain is good, this build lacks in heavy attack flexibility, and regaining stamina after a death-and-revive may prove challenging without orbs, shards, or potions. This problem is especially compounded in CC-heavy trials such as the Halls of Fabrication. 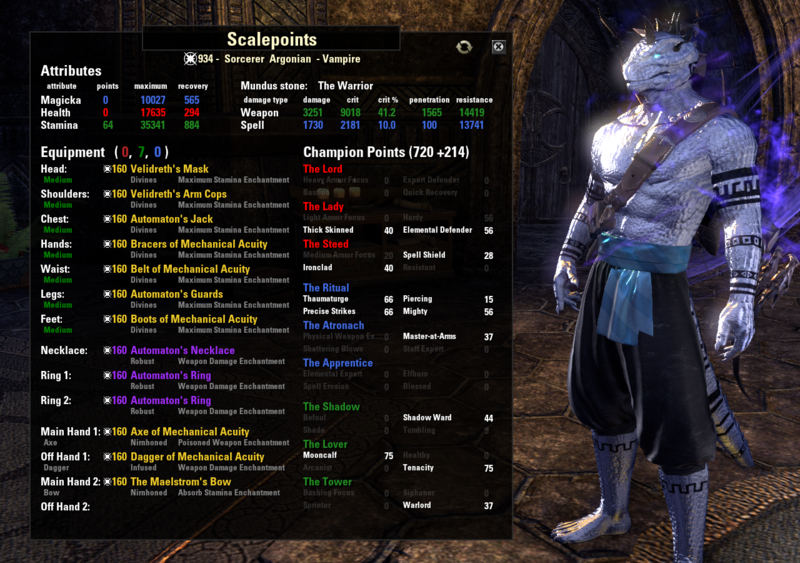 And yes, this means I'm handicapping myself somewhat by playing an Argonian; f**k yeah lizards. Vampire it up. It looks ugly, but it'll give you 10% more stamina recovery. Just pop on a skin or wear some full armor. Or just use a Dwemeri Tonal Attenuator / Executioner's Hood and Nordic Bather's Towel to hide your ugly mug yet embrace your beautiful skin. You shouldn't really need the Dubious Camoran Throne for the stamina recovery. While the sustain on stamsorcs is quite bad, you shouldn't have much trouble with the stamina sustain with the number of heavy attacks we have. Even in vHoF, I wouldn't suggest it. Just pop an orb or two once in a while. One particular exception to this, however, is that you're going to want more stamina recovery on the final boss of vHRC; that fight is even more draining than the entirety of vHoF, so what I like to do there is switch to the Dubious Camoran Throne and put on a piece of armor that has a full health glyph on while running through the corridor to the final boss room. Keep in mind that this does not cover vMA; that will be a different build all together. In trials, based on your group composition and penetration, you may want to take points out of piercing and assign them to Thaumaturge, Precise Strikes, Master at Arms, and Mighty, in that order. Here's just my preferred setup. Stormfist's proc is not as good, but its stamina recovery 1pc still makes a really noticable difference for sustain, and is pretty much necessary for the Halls of Fabrication. The proc itself can also proc your Implosion passive for more damage. Automaton is really good, better than Hunding's Rage, but it is much more annoying to acquire. So far one of the best sets to use, in my opinion. As a result, since the effects of Mechanical Acuity scales more the less crit you have, you may want to go with an axe/dagger setup when you're using it. As for Mechanical Acuity versus Automaton when paired with TFS, they're pretty much on-par with each other. I personally prefer Mechanical Acuity since it is more damage and also synergizes really well with Ballista, but if you're low CP and can not put 61 points into Precise Strikes, Automaton may be better overall for you. Optimizing stamina setups in coordinated groups is much more of a flexible subject, one that I would rather not go into detail on. Instead, I highly suggest giving Alcast's Stamina Optimization guide a quick read. Basically, from the above sets, except for TFS, pick any possible (as in, you can't go Hunding's + NMG due to both of them being crafted sets) combination of the two, and prioritize having one set of Sunderflame and NMG in the group first. I can see stamina damage-dealers wearing Alkosh in place of VO; the 5pc synergy proc on it could function as a decent DoT as well as the debuff, and it can be worked into rotations as long as there's a steady stream of synergies. Suppression Field - a great AoE ultimate that also happens to apply your Ruffian passive from Dual Wield; use on trash fights. In this build, you have one flex spot, and that is Critical Surge, though to be honest, I'd say that Critical Surge is the best ability to slot in there due to it being one hell of a self-heal as well as 2% more weapon damage from the Expert Mage passive. For more damage without care for survivability, you can slot a random Fighter's Guild ability for 3% more weapon damage. You can also slot Vigor in case you want to heal your teammates. 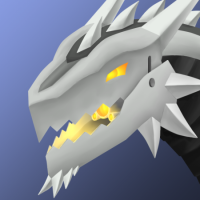 With Dragon Bones, the Greater Storm Atronach ultimate is currently the most-desired ultimate for both stamsorcs and magsorcs due to its decent damage and, more importantly, 8s 25% damage boost for whoever synergizes with it. It also has a really good range, so you don't have to summon it directly on top of a boss. In fact, it is encouraged that you place it where the melee damage-dealers are so the tank won't take it and the damage-dealers can synergize with it easily. However, Ballista is still the best ultimate you can use if you want pure damage for yourself. Another thing to keep in mind is the choice between Razor Caltrops and Anti-Cavalry Caltrops. Rotations are covered below. If your rotations take less than 13 seconds, Razor Caltrops will deal more damage. However, if your rotations take 13 seconds or more, Anti-Cavalry Caltrops will be better. The damage difference between them at 13 seconds, however, is fairly negligible, so it shouldn't matter that much. You can also choose to do one less heavy attack in some rotations and lower the downtime on most of your DoTs, and that should make Razor Caltrops more worthwhile than Anti-Cavalry Caltrops. One more thing is my choice of Lightweight Beast Trap over Rearming Trap. In my rotations covered below, I will be casting Lightweight Beast Trap twice, which will keep Minor Force up. Lightweight Trap also deals much more damage than Rearming Trap, and from my own testing, casting Lightweight Trap twice actually outdamages a Rearming Trap + Shrouded Daggers rotation. Additionally, this frees up an extra flex slot for me to slot Critical Surge, and lengthens the amount of time I am on my front bar by 1s, also boosting my damage. So far, this rotation grants the highest amount of single target damage, and I personally prefer it this way because I have enough AoE damage already from Endless Hail, Caltrops, Deadly Cloak, and Hurricane. Just remember that heavy weaving into Lightweight Beast Trap requires a bit more timing finesse, same with Caltrops; a trick is to cast that ability when your weapons start swinging, not before they're finished winding up. What about the cleave damage from Shrouded Daggers? I understand if people prefer cleave damage (even though you might as well use Steel Tornado on trash and ignore the cleave on bosses). Here are some variants on the meta rotation most end-game stamsorcs use. If you really want that cleave damage and can not sustain the v.3 version of the rotation listed above, try Acid Spray. This also gives you room to frontbar Rearming Trap, so you get 3% more weapon damage on your frontbar. Only thing you'll lose out on is the execute damage and the spammability of Shrouded Daggers, but at this point you'll have dealt much more damage from Acid Spray already. Look at me, breaking the meta without even playing it. Shout-out to BlackMamba19 for helping me test this! Optimal raid blue CP for this setup: 66 Thuamaturge, 61 Precise Strikes, 64 Mighty, 15 Piercing, and 34 Master-at-Arms. Based off of BlackMamba19's CP for this setup in CwC: 61 Thuamaturge, 56 Precise Strikes, 64 Mighty, 18 Piercing, and 31 Master-at-Arms. Keep in mind that these are the rotations that I use and find work well for me. This rotation length is ~12 seconds per rotation, approximately the length of Razor Caltrops. Keep in mind that your ping can have an impact on your rotation lengths. A difference in 150ms ping is equal to about 0.2s difference per heavy attack and 0.1s per light attack. Based on that, you may want to tweak the number of heavy attacks you do to match the rotation length, and maybe switch out your Automaton gear for VO if you need a bit more sustain. Suppression Field is there due to it buffing the Ruffian passive from Dual Wield. However, keep in mind that Suppression Field does not work on elite enemies, such as the Sun-Eater in MoL. They do, however, work on smaller enemies, such as the spheres in HoF. In any case, if you are up against elite enemies, just use your Flawless Dawnbreaker instead. Have you considered Strength of the Automaton set over Hunding's Rage? The Weapon Power only applies to to Physical Damage, so you lose out on Poison Injection - but that's about it; everything else is physical damage. You lose about 800 crit rating, but gain over 200 Weapon Damage for all your abilities (excluding Poison Injection, which loses about 200). Have you considered Strength of the Automaton set over Hunding’s Rage? The Weapon Power only applies to to Physical Damage, so you lose out on Poison Injection – but that’s about it; everything else is physical damage. You lose about 800 crit rating, but gain over 200 Weapon Damage for all your abilities (excluding Poison Injection, which loses about 200). I have! I have it filed under the "Untested-but-promising Alt Gear" section. The reason why I'm not using it is... because I don't have a set of it yet. Any raid parses so we could see this amazing build in action? I really enjoy ur idea and build, congrats for it! I'm back! Have been testing what this build is capable of in more favorable ping conditions. So far, the previous rotations still hold up as the best from what I have tested, though the rotation length itself has been shortened slightly as a result. I have updated the guide to talk a bit about ping and its impact on heavy attacks and rotation lengths, along with new solo parses that demonstrate what the build is capable of in my current location. One can definitely trade TFS and Kra'gh's out for other sets in coordinated trial runs. NMG and Sunderflame are both great replacements to TFS (you can't run NMG + Hunding's, so do NMG + VO), and if those two have been taken, feel free to go all out in Hunding's + VO. Kra'gh's is not a popular choice for trials due to its melee nature, but I do enjoy it and employ it in fights where I stand still with the boss. Velidreth is considered by most to be the best choice for trials, which I do not disagree with, but I actually like to switch monster sets around to match what I'm doing with boss mechanics. I've covered those in the guide already under Gear. 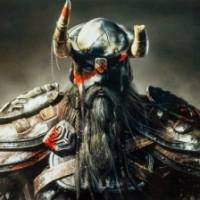 Nirnhoned and Infused are both better traits than Sharpened. 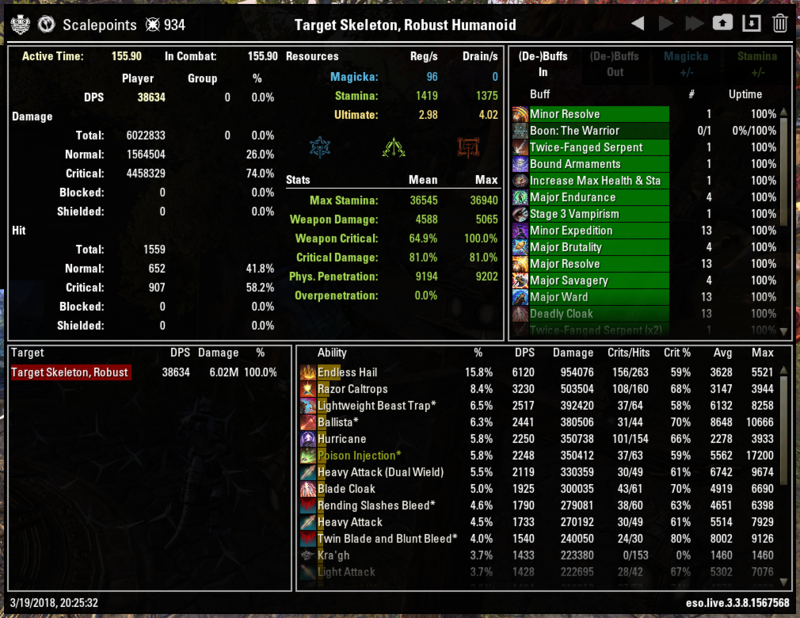 The only reason I'm using Sharpened on mine is that I do not have a Nirnhoned or Infused vMA bow. Thanks RNG. In parsing terms, not really. NMG actually out-damages Hunding's Rage by a small amount, but the reason I like to use Hunding's Rage is that I prefer to simulate a more accurate raid scenario with TFS taking the place of the typical NMG+Sunderflame combo, and I also have to watch out for overpenetration; that's why I do not run NMG with TFS. However, if you watch for overpenetration and adjust for CP accordingly, you should be fine running NMG with TFS. Just make sure no one else in your group has NMG; the buff doesn't stack. With both infused and regular crusher enchants in mind, just go ahead and use the build and CP I have listed; 2pc Kra'gh's, 5pc TFS, 5pc Hunding's, 37 piercing. Just make sure not to use a sharpened bow or you'll overpenetrate (same with sharpened dagger, though to much less of a degree). Sort-of updated for Clockwork City. I say "sort-of" because I still need to farm for transmutation stones to test multiple different builds. However, I can safely say that the HotR setup can be quickly adapted for CwC while you guys farm for those stones; just plop on a weapon damage enchant on your bow and you'll be good to go with no real dps loss use some ravage health + gradual ravage health alchemical poisons on your backbar. Remember to allocate your CP. For me, I put 8 more points into Mighty and 2 into Piercing. Right now, the closest definite answer for BiS will be a nirnhoned bow with ravage health + gradual ravage health alchemical poisons; this is not from my testing, but from what others have done. You mean you Play with one weapon dmg enchant on the dagger and anotherone on the Bow? Simply a quick and cheap fix until I can figure out a better solution; the theorycrafting is still a work-in-progress. So many setups I wish to try, after all. UPDATE: Yep. Tested it in hopes of trying to go for a disease enchant on an infused offhand on the frontbar. Have yet to test that previous setup on an infused bow though. For now, the ravage health + gradual ravage health alchemical poison on the bow bar is just way too powerful not to use. I'll edit those into my posts. Keep in mind, still a WIP. It was a slight nerf to the vMA bow's damage. However, with the introduction of the dual ravage health poison as well as the extra CP you can assign, it's an overall damage buff. 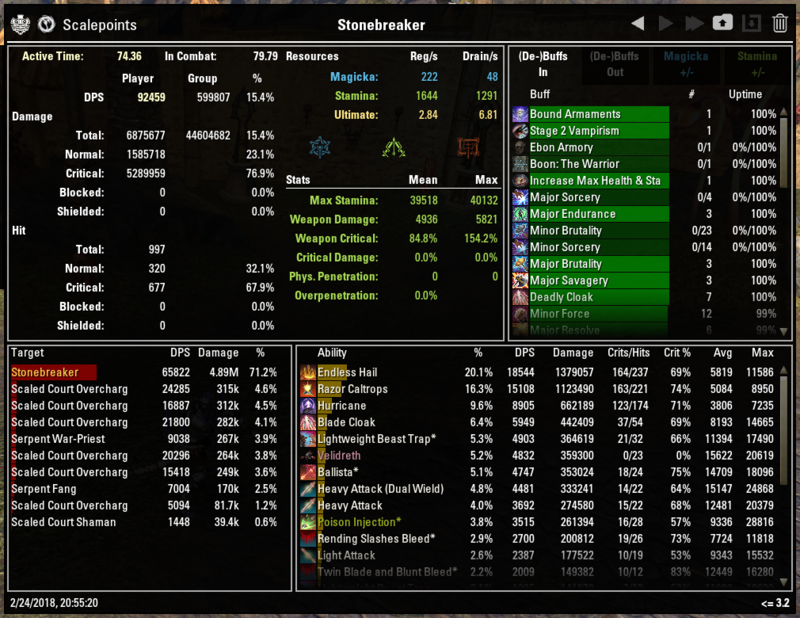 I managed to parse 37.8k solo on the 6mil dummy. I'll upload that soon. It was a slight nerf to the vMA bow’s damage. However, with the introduction of the dual ravage health poison as well as the extra CP you can assign, it’s an overall damage buff. 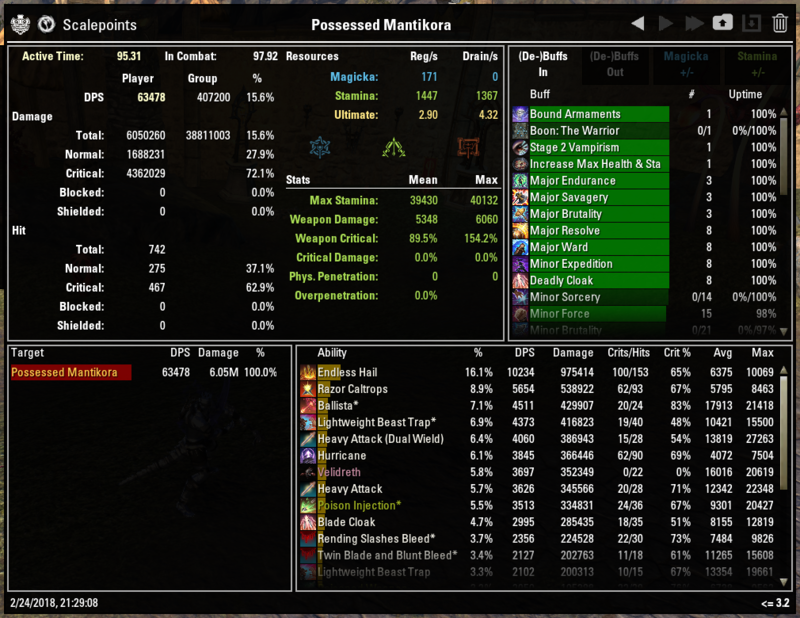 I managed to parse 37.8k solo on the 6mil dummy. I’ll upload that soon. Well thats awesome man hey if i dont have a vma bow yet will my dps in cwc be closer to that of a vma bow compared to hotr im on console so cwc is yet to realease. Somewhat. It's going to be closer, but it's still quite a ways away from a vMA bow. You're really better off farming vMA for it. It's actually updated already, and pretty much finished. Only changes I will be making are either just cosmetic or extremely minor (I'm just lazy :D). I've updated the best traits on the dual wield weapons, but the damage difference is pretty much negligible so the previous setup will not break your build.